When choosing a piano, it’s essential to find an instrument that suits your lifestyle, budget, and space. 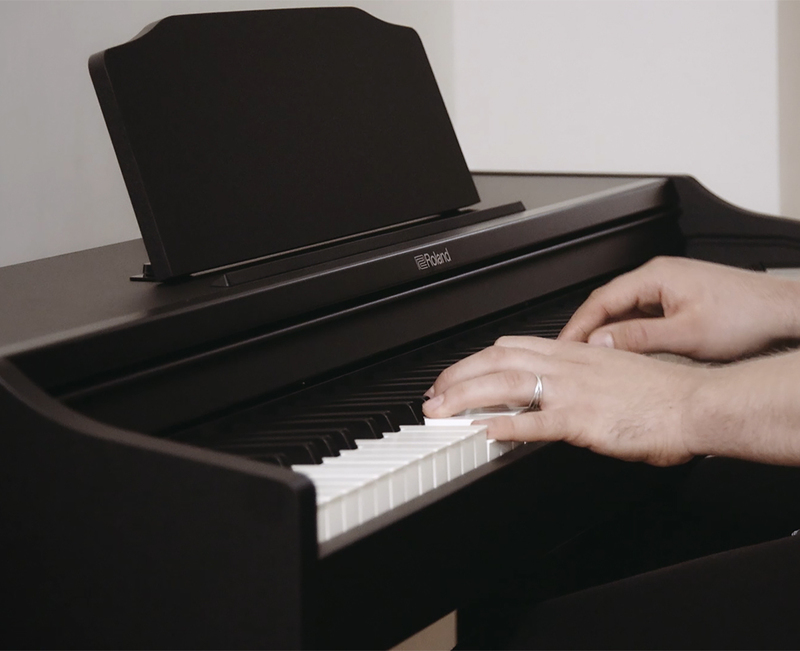 The Roland RP102 digital piano delivers on all fronts, combining authentic piano performance and onboard practice features in a compact and affordable design. It’s filled with technologies derived from our award-winning premium pianos—including a luxurious and supremely playable weighted-action keyboard—providing inspiring sound and touch that will continually support your music as your skills evolve. 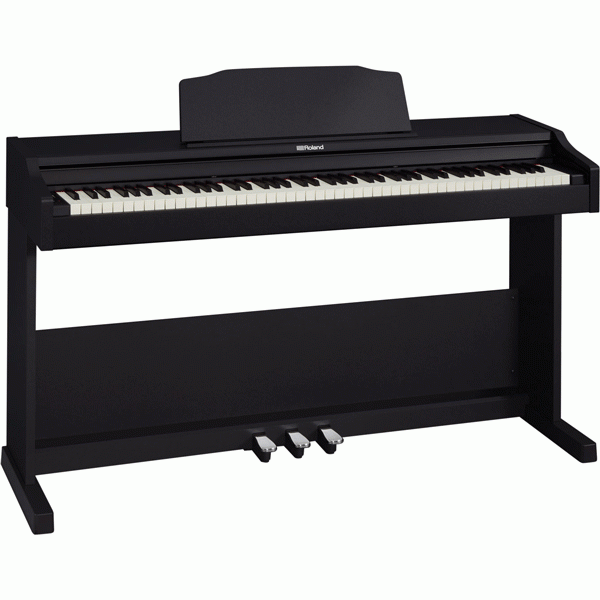 And with its streamlined cabinet and three integrated pedals, the Roland RP102 digital piano offers a traditional upright look that fits nicely anywhere space is at a premium. 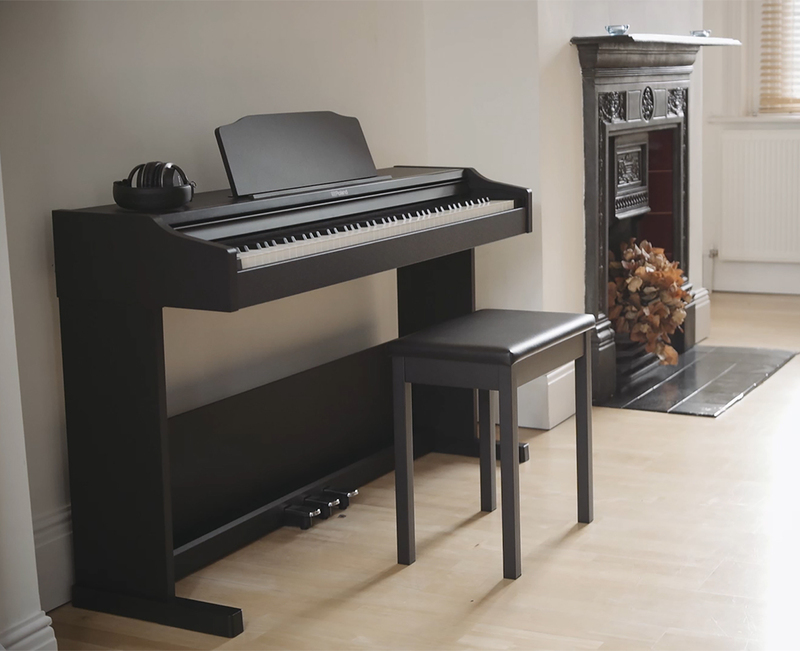 Thanks to its advanced capabilities, the Roland RP102 digital piano blends in seamlessly with your modern lifestyle. It never needs tuning or regular maintenance, and includes onboard Bluetooth® technology for connecting with a smartphone or tablet for instant enjoyment and enhanced learning. 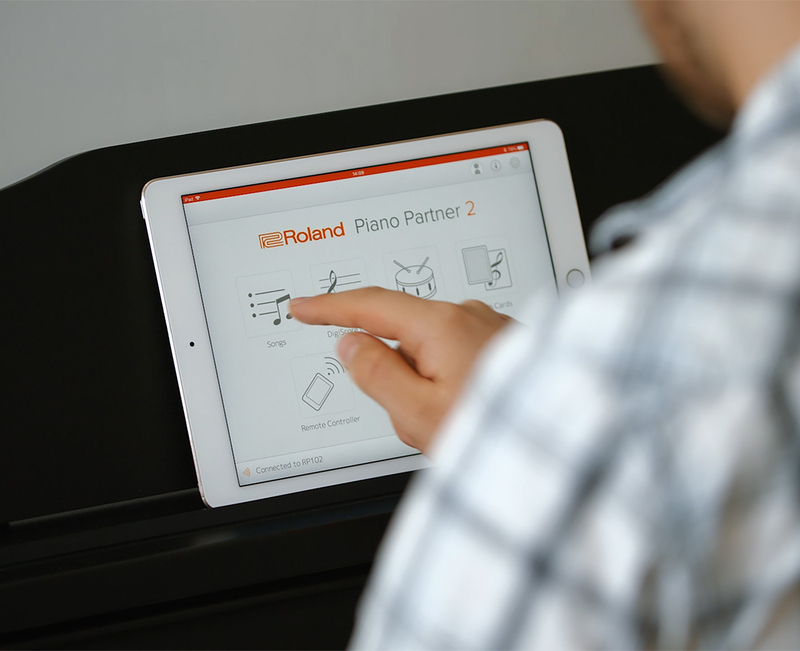 By wirelessly pairing the piano with Roland’s free Piano Partner 2 app, you can view digital sheet music, interact with backing rhythms, and access various features not available from the panel. 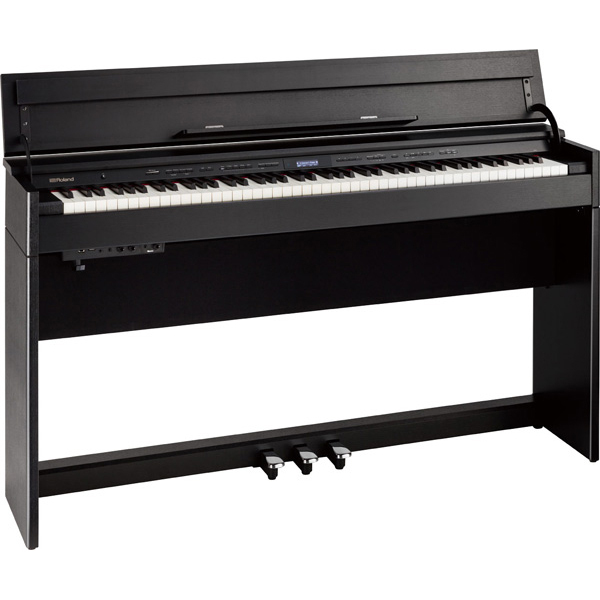 The RP102 is an exceptional piano value, at the ready to bring musical enjoyment for years to come. Roland’s free Piano Partner 2 app for iOS and Android mobile devices is the perfect companion for the Roland RP102 digital piano. 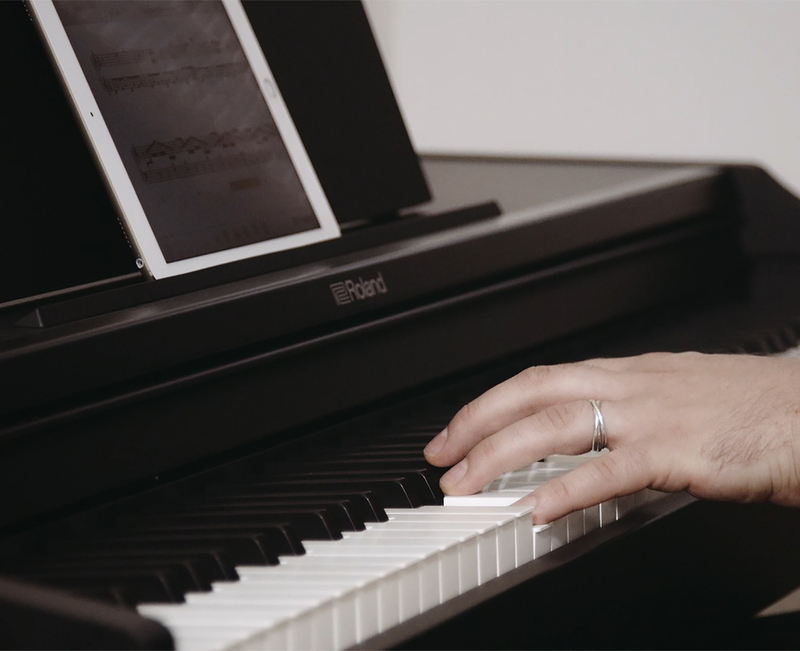 Via a wireless Bluetooth connection, it shows digital notation for the piano’s internal songs on your device’s display, and pages even turn automatically as a song plays. You can practice each hand individually by muting the left—or right—hand part, and freely adjust the tempo as needed. The app also provides access to backing rhythms and flash card games that help you build skills with intelligent accompaniment and engaging music exercises. 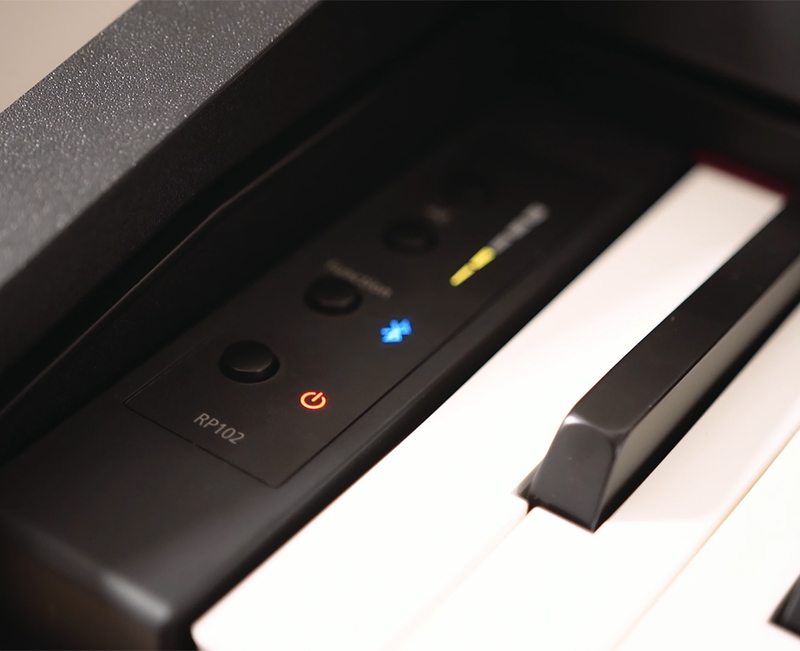 With its straightforward interface, the Roland RP102 digital piano lets you enjoy great piano sound with zero hassle—just press the power button, adjust the volume, and start playing. And if you want to dive into the piano’s deeper features, simply call up Piano Partner 2 on your favorite mobile device. From the app, you can choose from a variety of piano and non-piano sounds, and even layer any two sounds together. In addition, you can browse the piano’s onboard song library, select songs, and adjust the tempo numerically. Offering piano sound and touch derived from Roland’s premium digital pianos, the Roland RP102 digital piano will continue to inspire as your playing grows and evolves. Our SuperNATURAL technology delivers the rich, expressive tone you’d expect from an acoustic grand piano, while dynamic built-in speakers fill the room with immersive sound. 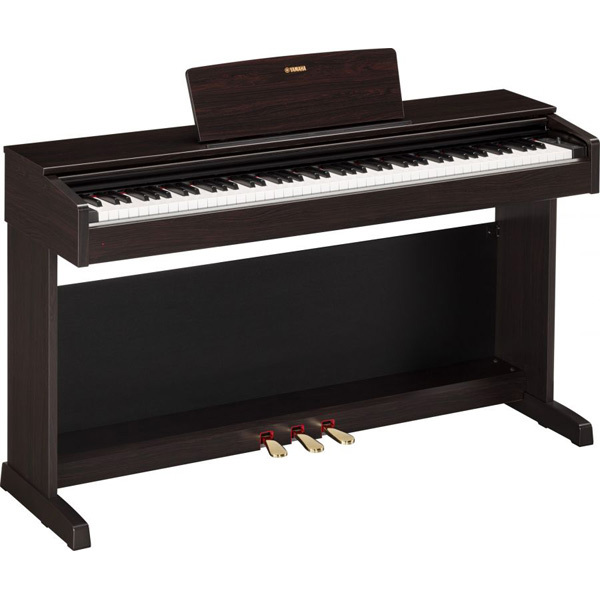 The PHA-4 Standard keyboard inherits the progressive hammer action and Ivory Feel texture of keyboards found in our high-end pianos, and includes advanced sensing technology to take full advantage of SuperNATURAL Piano’s enormous tonal range. This highly responsive keyboard follows every nuance of your developing touch, encouraging deeper levels of expression as your technique improves. The piano’s three pedals are made of metal for an authentic feel, and also support half-pedal control. This technique is required to play more advanced piano pieces, and is not possible on typical entry-level instruments that employ less sophisticated pedal switches.